All current GW undergraduate and graduate students, doctoral students, post-doctoral researchers, alumni, administrative staff, and faculty are eligible to apply as an Entrepreneurial Lead (EL). Academic Leads (AL) must be GW faculty members or other eligible GW Staff members. Accepted teams must commit to attending their cohort’s orientation, two training sessions, meetings with their mentor, a mid-program check-in conference call, and the final Presentation Day. Failure to complete these elements of the program may be grounds for disqualification from the GW I-Corps Site program and forfeiture and/or repayment of any grant awards associated with the program. Team and Commitment – The AccelerateGW I-Corps Site program seeks participants with an interest in entrepreneurship and technology commercialization. This includes a willingness to talk to non-scientists about your technology, develop hypotheses on how the technology might be developed into a product, and work towards technology development (rather than basic research) grants. Experience is a plus, but not a requirement. Intellectual Property Strength – Strong patent protection is characterized by broad claims that protect your technology and the space around it, as well as an understanding of related patents and publications that may limit your patent’s scope. A patent or copyright (or a willingness to file one) is a requirement to participate in AccelerateGW I-Corps Site. Technology Strength – AccelerateGW I-Corps Site deals mainly with early stage technologies in need of some level of validation. The committee will look at research to date that would indicate likely success, and at the technology’s potential to by applied to more than one application or to fit very well into the proposed application. 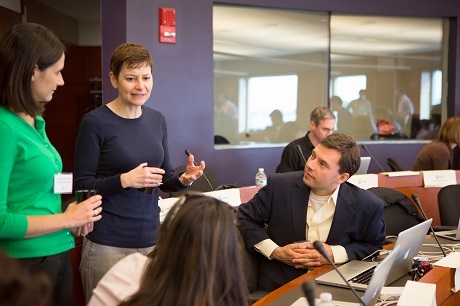 Fit with GW I-Corps Programs – The first and most important goal of AccelerateGW I-Corps Programs is to teach faculty and students how to think about commercialization. Teams that are enthusiastic about technology commercialization and have clear goals that fit synergistically with what is taught in the program will be favored. The committee will also look for teams with testable hypotheses regarding how their technology could be commercialized.